release 7" flexidisc with covers of "Don't Ask Me" and "Swimming Pool." If you don't know anything about Birthday Tapes, it's a wonderful series of recordings organized by astrological sign. A number of great artists have been invited and chosen to contribute to the series: Hannah Lew, Golden Grrls, Diane Cluck, and many more. These artists have covered everything from Jesus Mary and Chain to The Mantles, but have also used the series as an outlet to put out original, unreleased work. 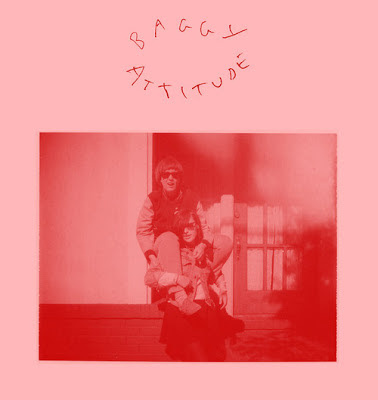 Baggy Attitude – the lovechild of Brilliant Colors' Jess and Veronica Falls' Roxanne – contributed last May 2012. The duo teamed up to create four songs for the series' split tape Gemini. Two of the songs "Don't Ask Me" and "Swimming Pool" (Chris Knox covers) have made their way onto a magical 7" flexidisc thanks to Wacky Wacko Records and C.O.A.T. I didn't really know much about Chris Knox before hearing Baggy Attitude cover his projects Tall Dwarfs and Toy Love. But in the process of learning more, I fell in love with both Baggy Attitude and Chris Knox. Baggy Attitude executed a refreshing bedroom pop take on "Don't Ask Me" which surprisingly still managed to stay true to Knox' scuzzy punk sound. Their washed out, girlish vocals added a layer of spontaneity to this song that wasn't there before. Despite being lighthearted lo-fi, this reeks of messy teenage vulnerability and the blues that come with that. Whereas in "Swimming Pool" I saw elements of Brilliant Colors, Veronica Falls, and even Chris Knox himself. A true revival of 70s rock, "Swimming Pool" is the old cassette that you discover in your parents' attic. And after much dusting off, you realize what an awesome find you just made. Needless to say, I want to own this like no other. My birthday is on the 19th so friends reading this please take the hint. Grab a copy of the limited edition flexidisc from Wacky Wacko Records.